There’s a group of people in San Clemente who don’t allow their age to define who they are, or what they can do. These are the people who love life and greet it head-on. Betty Hapke, at 77, is a woman to admire. 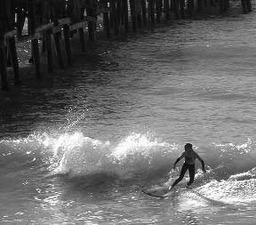 She learned to Boogie board about 13-years-ago and continued until age 75. She continues to swim daily to stay in shape. 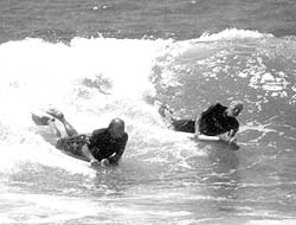 “I can remember the first time I caught a wave,” Hapke laughed. “Here I am this old lady on the beach and I’m screaming and laughing as I’m bringing the wave in. Everyone on the beach was looking at me and laughing, but I didn’t care. I was having a fabulous time! After 59 years of marriage, Betty is still deeply in love with her husband Norm. She describes him as a man who “likes to live on the edge.” At 82, Norm still goes scuba diving and takes his grandson with him. Leo has surfed with the Hobie 10’4” longboard over the years, and has a deep love and appreciation for the ocean. One of his longboards presently hangs in his Real Estate office in Capistrano Beach. 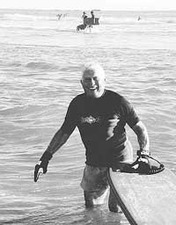 John Berges, 71-years-old, can be found boogie boarding at T-Street year-round. 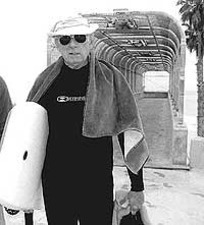 At 81, Neill Kohlhase is the oldest in the group of friends who boogie board at T-Street. He’s also respected as one of the best in the bunch. Neil Kohlhase A common thread connecting these old-timers is their passion for the ocean, and for staying physically fit. They swim, hike, golf, ski and play racquetball besides riding the waves. They stay young in heart, body and soul. For all of them, the ocean holds a special place in their heart.